« Of mice and birds – what is a zebra finch, really? Is the songbird vocal learning pathway specialized for song and independent from other tasks? First off, I wanted to say I’m working in a songbird lab now, so while I’m keeping this a general neuroscience blog, you’re probably going to start seeing more blogposts about bird brains. So, is the bird vocal learning pathway specialized for song and independent from other tasks? A new paper by the Okanoya lab addresses this very question. What is the vocal learning pathway? neurons in these areas firing is modulated during singing (and in some conditions during playback of the bird’s own songs) as shown by direct neural recordings and early gene expression studies. One of the brain areas in the vocal learning pathway is the striatum-like Area X, which appears to be a specialized structure surrounded by the more general avian medial striatum (MSt). Like the mammalian striatum, Area X receives strong dopaminergic inputs, but unlike the classic thalamo-cortico-basal ganglia circuit, Area X does not reciprocally connect to the dopaminergic vental tegmental area (VTA) or substantia nigra pars compacta (Person et al., 2008). It is unclear whether parts of the song system evolved out of basal ganglia circuits, but I believe all known vertebrates have basal ganglias, making the basal ganglia one of the most conserved brain regions. Vocal Learning Pathway (AKA Anterior Forebrain Pathway) – Warren et al., 2011 – Journal of neurophysiology. Because electrophysiological studies in mammalian striatum and avian MSt have shown that neurons fire in response to stimuli signaling food rewards and the rewards themselves, the Okanoya lab wondered whether Bengalese finch Area X neurons are modulated by food rewards as well. They designed two operant conditioning studies for birds to perform while they recorded from neurons in Area X. In the first experiment, if the birds peck at a red LED while it is illuminated, they are rewarded with food 50% of the time. If the birds pecked at the LED while it was off, they received no food, and there would be a greater delay before it illuminated again. A second experiment the LEDs lit up either red or green, with 50% probability and arandom sequence. If the bird pecked the LED while it was red, it received food 100% of the time. If the LED was green when the bird pecked it, the bird received no food, however the bird was required to peck it to proceed to further trials. This way experimenters could separate out a visual stimulus from it’s association with reward and also control for the general motor movement of pecking. However, it seems to me that to properly learn the task, the bird must learn to peck the green LED to continue on in the trial, see more red lights, and get more food rewards. After the animals learned these tasks, they performed the tasks while experimenters recorded extracellularly from neurons in Area X that were previously shown to be modulated by song (n=19 neurons for task one and n=25 neurons for task two), and a few neurons that were not modulated from songs (when looking at the inter-spike interval). Two examples of Area X neuron firing during the task are shown above. Many neurons showed differential responses between reward trials (when the peck was followed by food) and non-reward trials (when it wasn’t). Standard deviations in spiking rate were significantly greater in reward trials than non-reward trials (p < 0.001). In experiment 2, birds were slower to key-peck the non-rewarded key. As in experiment 1, the SDs of firing rate were significantly higher in reward trials than non-reward trials. 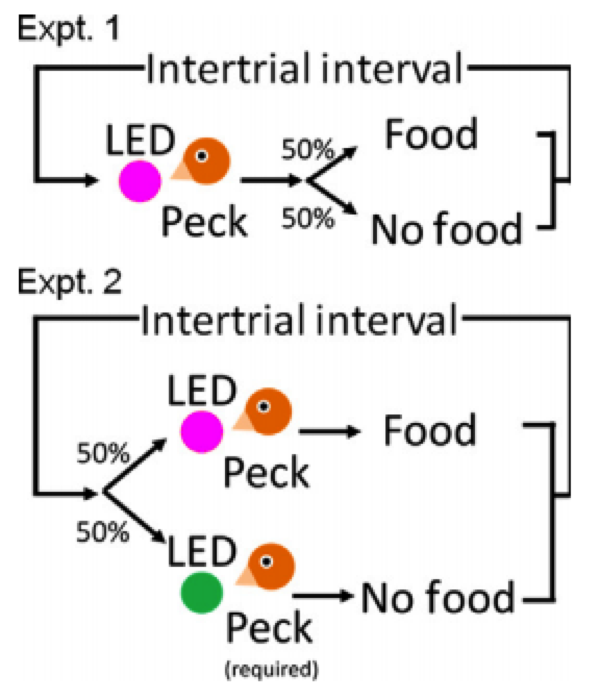 Neurons recorded in experiment 2 showed different firing on the red LED reward trials, than the green LED no-reward trials, before they even pecked or got their food reward. I think the authors did a fairly convincing job of showing that Area X neurons are modulated by non-song related tasks. How important this signaling is for normal behavior is unclear. The majority of neurons they recorded from seemed to modulate their firing much more during song. I wonder if Area X might be not a song learning area, per say, but an elaborated thalamo-cortico-basal ganglia loop that is specialized for beak, and vocal organ movements. I wonder if the modulation seen in this study could relate to motor planning for the actual eating movements. For example, the birds showed a much longer delay in pecking for the unrewarded condition in experiment 2. Maybe the difference in activity upon seeing the reward or non-reward light related to a difference in the movement made as opposed to directly coding the reward of the visual signal. Monkey studies sometimes try to control for this by training the animals to have to respond to non-reward trials with an equal speed as reward trials. As the experimenters mention, monkey studies also try to separate out cognitive processes from related motor activity by recording directly from muscles with electromyography EMG. Another way to try to minimize this confound for this would be to change the reward from a food pellet to some sort of juice delivery (though the bird would still have to swallow), or perhaps an IV drug delivery, though the drug’s affect on dopamine systems might also modulate area X activity. Similarly, perhaps they changes in activity we see are due to dopamine signaling, but will be irrelevant to the plasticity of synapses in this circuit because they are not directly-locked to a movement. So perhaps Area X is song-specific, but VTA and SNpC are not. Area X is slightly modulated by VTA and SNpC but effectively can ignore their signaling. One strange part of this study is that they implanted the birds with testosterone secreting tubes to increase the rate of song. However, as they mention testosterone has been shown to change behaviors in some cognitive tasks, so could confound the results. Getting Bengalese finches to sing with electrodes in their brain is challenging, but it is done all the time without using testosterone supplementation. A possible confound of these experiments is that the birds only heard the mechanical feeder sound on the trials they received food. A better control would be to have the exact same sounds, to make sure the Area X neurons are not being modulated by sound. Finally, I’m curious about the converse of this question. Is the rest of the striatum modulated during song, similarly to how this study showed Area X was modulated by non-song stimuli? Hope you enjoyed this article, please check out other posts on my blog. If you liked this blogpost about songbirds, you might also like: Of mice and birds – what is a zebra finch, really? Feenders, G., Liedvogel, M., Rivas, M., Zapka, M., Horita, H., Hara, E., Wada, K., Mouritsen, H. & Jarvis, E.D. (2008) Molecular mapping of movement-associated areas in the avian brain: a motor theory for vocal learning origin. PLoS One, 3, e1768.